You can purchase a lower-priced hearing aid today with a wider frequency response and better fidelity than even a premium-level hearing aid bought just a year ago. Most hearing aids last five to seven years. Manufacturers usually stop making parts for hearing aids after about five years, so older hearing aids are repaired at an all make repair facility, often with used parts. The older the hearing aid, the less likely it’s performing as well as it should. Like other technology, hearing aids are rapidly advancing while also becoming less expensive. You can purchase a lower-priced hearing aid today with a wider frequency response and better fidelity than even a premium-level hearing aid bought just a year ago. Just as it takes some time to recognize your hearing loss in the first place, a change in your hearing or ability to fully understand sounds may also go unnoticed. 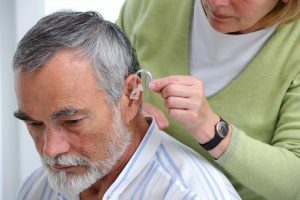 In some cases, patients may complain that their hearing aids just don’t work as well as they used to, but testing may confirm that the devices are fine, it’s their hearing that has dropped a few frequencies. Usually the solution involves a visit to your hearing professional for some fine-tuning, but if your hearing has dropped significantly, you may need to consider a stronger or higher-fidelity device. An advancement in age may also contribute to the need for a new hearing aid, invest in hearing aids with bigger battery doors and automated noise and sound control to reduce the amount of fiddling you have to do with your hearing aids.